Found Footage movies 101 – Expect to get nauseous. If you can’t handle that, do not watch them, or you will get sick. This is what I walked away from “Project Almanac” learning. Not that you shouldn’t try to rewrite history, or force people to change just to fit your needs, or that time travel is dangerous. But that is almost guaranteed you are going to get motion sickness after watching a film like this. The strange part is that I’ve watched several found footage films like “Project Almanac” before, like “Chronicle,” “Cloverfield” and “The Troll Hunter” but never have I watched a film that made me so physically ill. It was hard to watch this one because of all the constant camera movement and blurry colors, not helping by the effect of time travel being shown by the film footage skipping and degrading. David Raskin (Jonny Weston) is a brilliant high school student who has just been accepted into MIT, but has very little scholarship money and his mother is forced to sell the house just to pay for his tuition. As David is cleaning out the attic though, he finds his father’s old camera, with footage of his seventh birthday part and a flash of David’s seventeen year-old self. David and his friends try to put the pieces together that eventually lead them to find a long forgotten project in his father’s basement and just might involve time travel. Right from the beginning of the film, I had one question on my mind – Why does this movie need to be filmed like this? Why make it like a found footage film? In “Chronicle” they had a reason to do it like that – the main character wanted to document how terrible his life was. In “The Troll Hunter,” they were literally making a documentary that turned into a story about them as much as the man they were following. But in “Project Almanac”? David’s sister just likes to film, and that’s the best explanation we get. It made sense for the opening scene, since that was the footage David was sending to MIT and showcase his first project – a toy helicopter that he could control the altitude of with his fingers. But everything after that point makes no sense, especially when David and the gang break into the school to steal hydrogen capsules to make their experiment work, and she is filming everything. That’s like posting a selfie of yourself right after you rob a bank and say “Come and get me coppers!” on Facebook. You don’t film yourself while committing a crime. You are incriminating yourself. “Project Almanac” also violates the one camera perspective many times, as there are several points where it seems like the camera is moving on its own or will cut away to another camera that we did not know existed. This is especially the case during the worst scene in the film, when David and crew travel to Lollapalooza from the previous year. The film will sometimes randomly cut away to different cameras in the crowd, or David’s sister will weasel her way in to get the best angle of David making the moves on a woman, without anyone else noticing her. Not to mention, the camera is at its most shaky and blurriness while at Lollapalooza. I had to look away several times because the cameraman was bouncing up and down, only to cut away to blurry fireworks. However, if anything good came out of “Project Almanac” it was David’s two best friends, who are self-absorbed and a bit annoying, but they’re teenagers and these actors nail that teenage personality perfectly. They think about all the things they could do with time travel, including winning the lottery and going back to meet famous people, David says that would be selfish, and then they end up winning $1.8 Million in the lottery anyway. Bad writing for David, but fun to watch his friends exploit these powers. 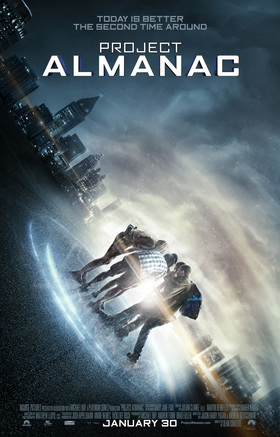 Overall though, it was hard to get through “Project Almanac.” Not just because of getting sick from the constant shaky cam, but it makes no sense that this film should be found footage and doesn’t even stick to it at times. The characters are poorly written, the plot makes very little sense and the time travel gets old fast. David’s friends save the film a bit, but not enough to make this a good film. If you go see “Project Almanac,” bring a carbonated beverage to drink to keep the gas out of your stomach. It always helped me on long car rides and I could have used it with this one too. Thanks for the dire warnings. I had already decided this was one for me to avoid when you wrote about how sick-making the camera movements are. The whole found footage thing can work very effectively indeed when it contributes to the story telling and is embedded within the logic of the plot but too often it is just a lazy, gimmicky device. And it needs to stop. Because it also makes me want to hurl. However, it doesn’t seem like a movie worth enduring the queasiness for. When so many great film projects are struggling to secure funding, it is pretty galling that tat like this appears to be is still getting churned out. Thanks again for the warning.